Would you like to make a tax deductible contribution to support the life of this parish? Use the “Donate” button to the left to make a secure, online donation through PayPal. Would you like you to support St. Mary’s Church while doing your usual shopping through Amazon? St. Mary’s Church is now accepting donations through AmazonSmile! 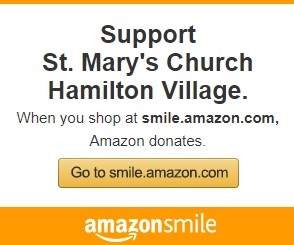 When you shop at smile.amazon.com Amazon will donate 0.5% of the price of your eligible AmazonSmile purchases to St. Mary’s Church. The best part? All you have to do is shop for your favorite items like you usually do and look for those eligible for Smile donations.